Generate & Preview Ad: Select a template then you this button to preview how it will look for the vehicle you have selected. Create New Template: Click this to start a new template from scratch. Each time you create and save a new template it will be named CUSTOM followed by a number; ex: CUSTOM5 means you have 5 saved custom templates. They will then appear in your template dropdown list only on this computer. Each computer you use DSMC on will need it’s own templates created. Edit Selected Template: This option lets you take one of the preloaded templates and edit it according to your specific needs. There is a template called “Everything” that we created so you would only need to delete unecessary data from the template. This makes it easier creating your own template. 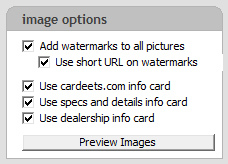 Add watermarks to all pictures: This option puts a colorful overlay on all of your images with dealership and contact information. To choose your color scheme go to the HOME tab and look under EXPORTER SETTINGS in DSMC. Use short URL on watermarks: We have developed a technology that assigns each vehicle a unique ID called a Car Deet ID. 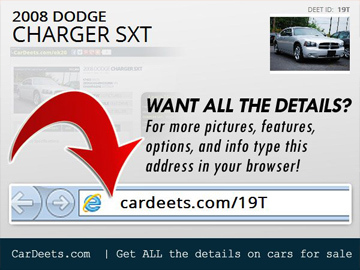 Using that Deet ID on the end of the CarDeets.com URL we have created a shortened URL making it easy for customers to navigate themselves to your vehicle’s landing page. You can opt to display that short URL to make it easy for shoppers to navigate to that vehicle detail page or you can uncheck it and it will list your website URL. 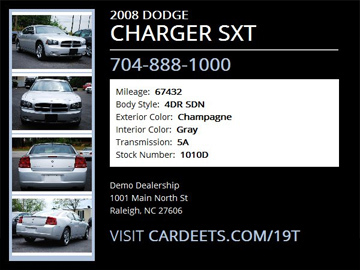 Use cardeets.com info card: This info card provides a clear message on how shoppers can see more details about this vehicle. If this is checked one of the 24 images will be the info card as seen below. Use specs and details info card: By checking this box one of your 24 pictures will be a vehicle specification card that provides basic vehicle data like color, transmission, body style, stock number, etc. 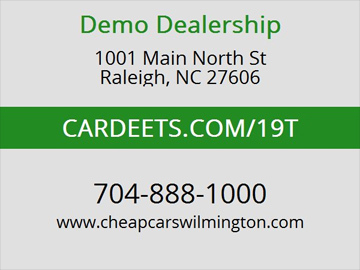 Use dealership info card: By checking this box one of your 24 pictures will be a text image with your dealership name, address, phone number, website, and CarDeets.com link for quick access to your vehicle landing page. Ready for Step 2: Ad Info now! What if I don’t want my contact info on my images? Go to the HOME tab and under EXPORTER SETTINGS choose to hide account info on DSMC sites. Then make sure to uncheck the Use dealership info card as well. Can I use HTML when making my own templates? YES! Be careful, however, because craigslist really limits the HTML you can use. Go to craigslist.com > Help to see what HTML is allowed in ads. What’s the benefit of making my own template? You are given FULL CONTROL over what information appears in your ads. If you want to write up a short paragraph to have for each car posted you can do that in the template editor so you don’t have to put in on each of your cars in the notes section. Same with your contact info. We really opened this up for your benefit. Be sure to take advantage of it! I want my own image on every car instead of those info cards. How do I add my own image? We knew you would want this and we are working on it! Soon we will allow a custom image to be used on you ads. It will be an additional charge to ad your own image. If you want to start creating one the dimensions MUST BE 600 x 450 pixels. Can I change what specs show on the specs card? Can I edit any of the added images or watermarks?